Based on tried and tested predecessors, the new standard range is available in three models to ensure an accurate match with all applications, the new washers are capable of washing up to 56 weigh pan/scale pan heads, along with radials and other accessories, in just two to 30 minutes depending on the level of soiling and the wash cycle selected. The new washers are an ideal solution for manufacturing plants where there is a requirement for regular changeovers when, for example, introducing a new flavour, and for sanitising pans after they have been used with common food allergens such as nuts, seeds, soy, milk or dairy products. Designed after consultation with customers, the weigh pan washers are small enough to sit on mezzanine floors next to the weigh scales, so there is no need to carry the weigh scale pans downstairs for washing. This helps reduce the risks to workers’ health, and increases safety. With easy manual loading and unloading, the new machinery offers a pre-programmed menu of up to seven different wash cycles that are readily selected by the operator. The smaller models have four pre-set programmes that are set up by the commissioning engineers to suit each particular site requirement, the larger systems have an intuitive touch-screen user interface which is again tailored to suit the particular customer’s application. A pre-programmed self-cleaning cycle is also provided as part of the menu. A typical wash cycle on the PW56 includes a hot pre-wash at between 50-55°C followed by a recirculated detergent wash at the same temperature. 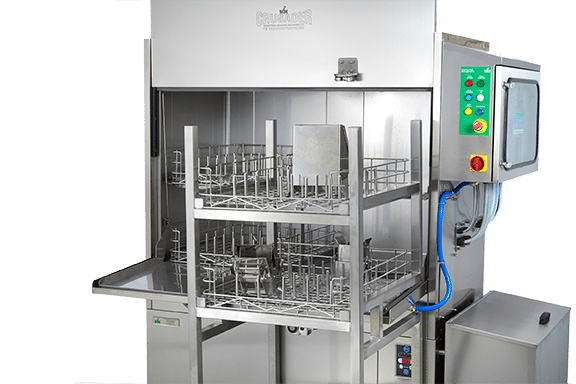 To ensure efficient cleaning of the weigh pans and ancillaries, the washing chamber is equipped with IWM’s proven and effective motorised TravelJet system, which incorporates corrosion-proof plastic bayonet type water jets or, optionally, stainless steel jets. The smaller compact CW13 systems have rotary hot water detergent wash jets and a guaranteed 85°C rinsing system. The hot water rinse at 85°C is usually sufficient to flash dry pans – especially stainless steel types – ready for re-use. A full hot air drying system can, however, be provided where the fastest possible turn around is necessary. All major components of IWM’s new weigh pan washers are fabricated from stainless steel to ensure long life and hygienic operation, even in high duty cycle applications in hard water environments. In addition, like all IWM machines, they have been carefully designed to eliminate dirt traps and to allow easy access to key components, including pumps and filters, making it easy and inexpensive to clean and to maintain. IWM have a number of flexible options to transport weigh pans and load them into the equipment, together with easily manoeuvrable racks and trollies designed to operate on the mezzanine areas.